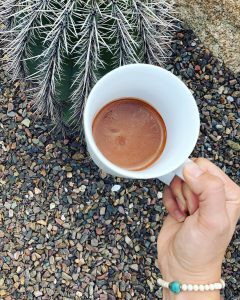 Drinking Cacao | Ridge's Stitches | Health Coach. Yoga. Clothing. I have been doing some research into drinking cacao and came across this brand called CaCoCo. Their product is outstanding but their business model is also incredible. They really care about the environment and that makes me grin ear to ear. Their packaging is recyclable and the bag the cacao is in is compostable. They practice regenerative agriculture. This means they do things that help to give back to the environment and replenish the soil versus just sustaining the land by continuing to do what has always been done. Boil water and pour about 2 Tbsp into blender or shakable vessel. I usually use a small mason jar with a screw on top. This keeps the jar hot so when the chocolate goes in, it doesn’t cool from the cold vessel. Shake to warm the glass. Add 3 Tbsp CaCoCo and ¼ cup hot water. Shake a few times then release pressure from jar by unscrewing the top. Then tighten and shake or blend until smooth.